Lufthansa Group is the largest airline customer for Airbus aircraft, which includes 45 A350 XWB jetliners on order as of March 2019. (Photo: A. Doumenjou, master films/Airbus). Lufthansa Group on March 13 announced two separate orders to add 20 Airbus and 20 Boeing airliners to its fleet, the largest in Europe. The deal for 20 787-9 Dreamliner aircraft – described by Boeing as the fastest-selling widebody airplane of all time – is valued at up to US$5.8 billion per list prices. 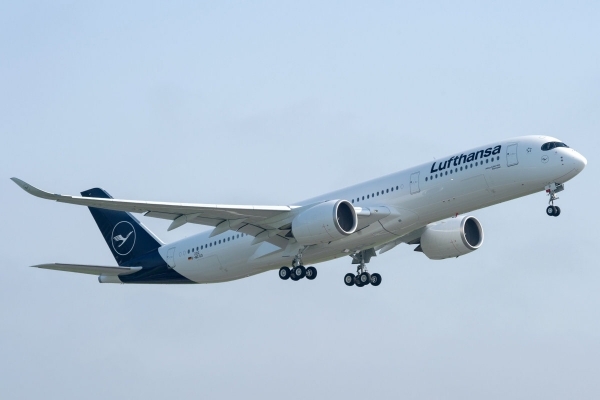 “We are very pleased that the ultra-modern Boeing 787-9 is now also expanding our long-haul fleet,” said Dr. Detlef Kayser, member of the executive board, Lufthansa Group. The airline group comprises network airlines such as Lufthansa and SWISS, as well as lower coast, point-to-point carriers like Eurowings.At 63 metres (206 feet), the 787-9 can fly 290 passengers, in a typical two-class configuration, up to 7,635 nautical miles (14,140 kilometers). Since its launch, the 787 has won more than 1,400 orders from now 76 customers. Boeing has delivered nearly 800 Dreamliner airplanes to customers around the world. Also on March 13, Lufthansa announced it signed an order for 20 additional A350-900 widebody aircraft. This latest agreement brings Lufthansa’s total orders for the A350 XWB to 45, with 12 aircraft already in operation. Lufthansa is the largest Airbus operator. “The A350 XWB meets all our expectations. The aircraft is extremely reliable and the feedback from our passengers is excellent,” said Kayser. Christian Scherer, Airbus chief commercial officer explains the A350 XWB holds the lowest seat mile cost of any large widebody airliner. “Lufthansa was one of the first operators of the A350 XWB and has been deploying the aircraft efficiently across its global network, becoming one of our best ambassadors for this great aircraft,” said Scherer. Lufthansa now has 674 Airbus aircraft on order (including the latest A350 order) and 574 Airbus aircraft in the Group’s current fleet (as of December 31 2018), including 28 A220 Family, 420 A320 Family, 100 A330s/A340s, 12 A350s and 14 A380s. The A350 XWB is designed to hold 300 to 400-plus seats with an ultra-long haul rated for 9,700 nm. At the end of February 2019, the A350 XWB Family had received 852 firm orders from 48 customers worldwide.